I hope everyone had a wonderful holiday. Mine was quiet although there is a lot going on with my family right now. I've been very busy with lots of things pertaining to my dad, so I haven't had time for projects. Today I want to share an old treasure my husband bought me for my birthday about 23 years ago. We used to frequent a junk store that surprised us once in a while with something gorgeous. I walked in one day and saw these dishes and fell in love with them. I think they are transferware. When we purchased them the store owner said they were from the early 1900's. This is the mark on the back. 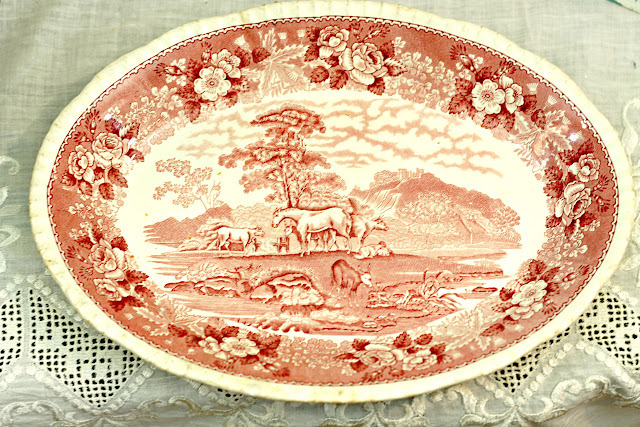 This is the large platter, There are four platters, each one has one of these two scenes. There are four dessert plates, seven salad plates and four dinner plates. Each with one of these two scenes. They are in very good condition with very little crazing and a little discoloration around the edges. I've been interested in adding to the collection, however the prices for one piece can be as much as my husband paid for this whole collection. Those are so pretty--enjoy them! Such a beautiful collection, Karen. Your husband is sweet to buy you the dishes. I hope things are OK with your dad. Take care! Gorgeous plates, Karen, and I love that lantern! 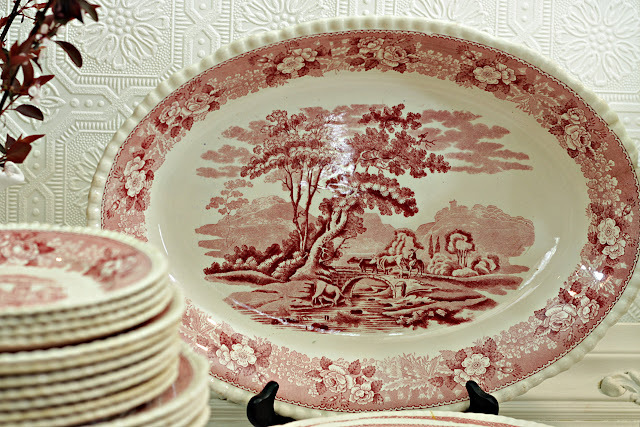 I love transferware and your dishes are so pretty. I love pink transferware and your pieces are lovely. What a nice gift, meanwhile my hubs is had enough with my dish-buying and I just saw some pieces I hope I can buy them myself. Have a lovely week. Beautiful dishes! 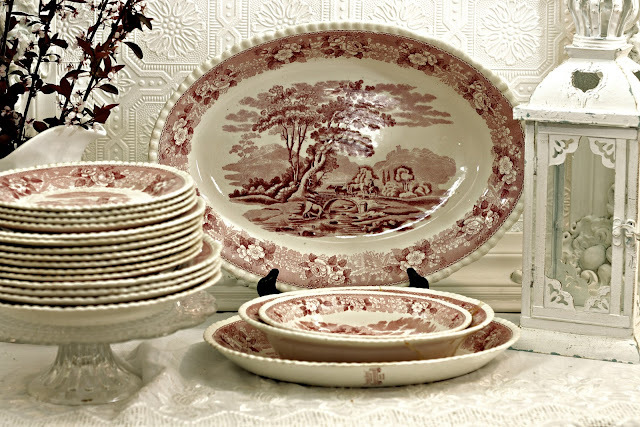 Transferware is always so pretty and it looks like you've got a wonderful set! Hi Karen! Oh, I love those pretty dishes! The dishes are lovely. How nice of your husband to buy them for you. I love your red transferware! I can see why you fell in love with the set. How sweet of your hubby to buy them. I've been told that English dishes made before 1920 say England, and those made after 1920 say Made in England. So the man who sold them to you was right about their age. I love them. 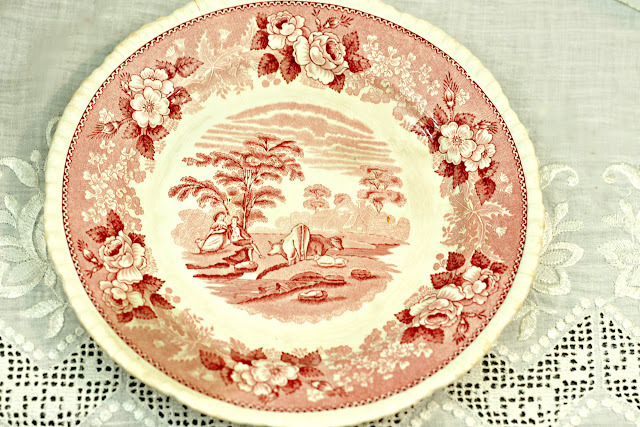 Beautiful vintage dishes...check eBay, they have great prices sometimes. Love your dishes, what a gift for your husband to buy you. Thanks for sharing. "I" love transferware and "He" must have paid attention. I love your transferware dishes! I would really like to start a collection, but you are right. They are much more expensive now. They will be so beautiful displayed in your kitchen. Those are gorgeous dishes Karen. I love the color. I hope your Dad is OK...he is lucky to have you, and you are lucky to have him too. Karen those dishes are gorgeous! It was sweet of your husband to purchase for you...hope all goes well with your dad. So pretty. Prayers for you and your family. I've been seeing a lot of the transferware on line -- I think the red is my favorite though -- thanks for sharing your pretty dishes and your sweet memories! They are so beautiful, I love transferware any color. Thanks for sharing. Yes, it is transferware. I have always liked this pattern by Adams. I've got a matching platter and soup tureen. Don't you love the pastoral scenes? Thanks for sharing! Absolutely beautiful dishes! I collect red and blue transferware myself! 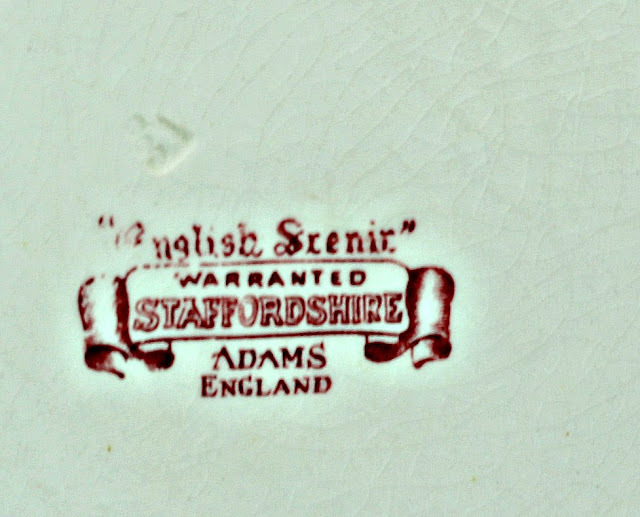 Your transferware is just gorgeous! What a lovely gift to enjoy for many years! 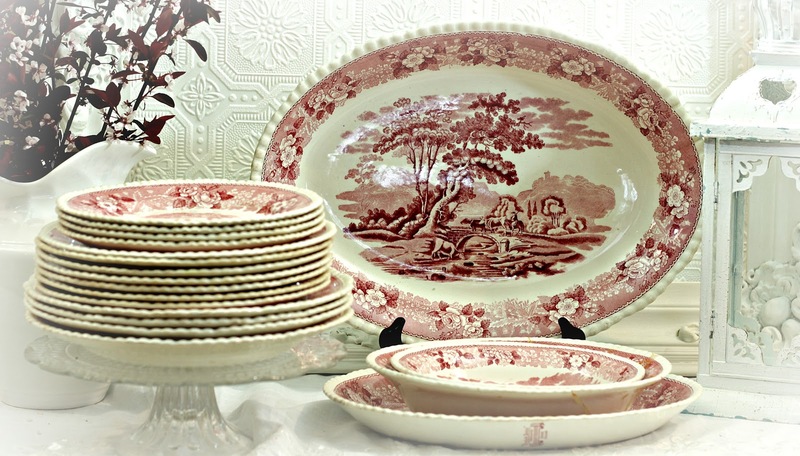 Great transferware collection. Some of it is quite expensive. I have some transferware that is very similar to this. 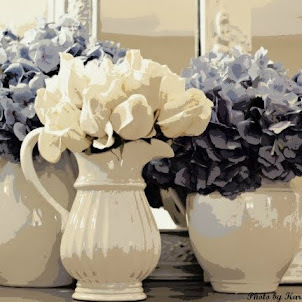 I adore transferware and have many different colors and pieces. Yay for transferware! What a lovely collection of transferware! I wandered over from "Show and Tell Friday" and I think your blog is wonderful. I had to follow such a talented lady! Your dishes are truly beautiful. I love brown or black transfer ware. I really need to make room in my house for some soon! thanks for sharing yours. What a GORGEOUS SET! I actually NEVER MIND crazing, "It's like a form of PATINA" to me! I especially LOVE the edging on your set! Anytime I see EVEN A SINGLE PIECE I "Grab it"! They all seem to blend so beautifully...But HOW LUCKY you are to have a set! If you get a chance, I'd love to have you peek into My Land of Blog too! what a lovely place you have here. I've found you following a comment you left somewhere and I'm so glad I have. Your red trnsferware set is to die for. 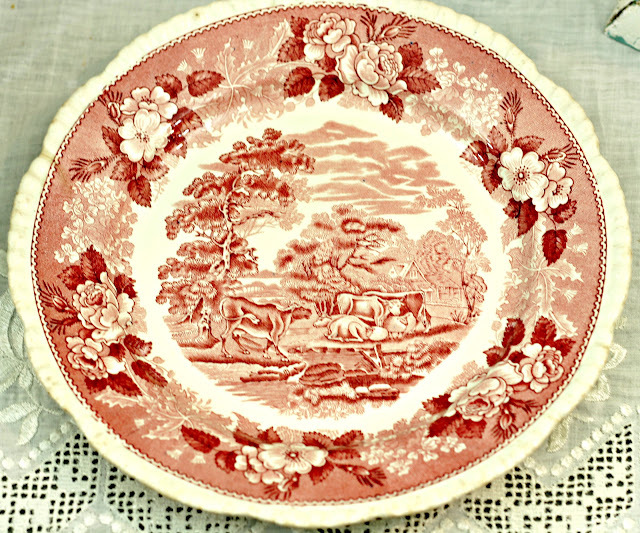 I'm addicted to english transferware, red being my all time favorite. I've got quite a few pieces myself but certainly not a gorgeous set like yours. Pop over to my blog if you have a chance. I'll keep the kettle boiling and will treat you to some tea in my red transferware teacups! They look so beautiful and they seem to be in fabulous condition! Lucky thing! I am very jealous! I have some new Spode dishes because it is so hard to find vintage dishes here in Australia. My weekly Say G’day Linky Party is on now and I would be so thrilled if you could join in and link up this great post! Those are gorgeous. Makes me want to pull my Granny's dishes out of storage. Someday . . .
Just found your blog and love it. Would love for you to share on Simple & Sweet Fridays. The vintage dishes are beautiful. New Follower. So, so pretty! Happy to have found your lovely blog. 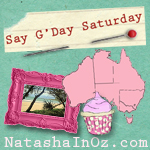 I just popped back to say thanks so much for linking up to my Say G'Day Saturday Party. I just shared this post on my new Facebook Page. Lovely dishes - what a sweet husband - I hope all is well - stopping by to say hello! Such a lovely post and lovely blog. Found you via Overflowing's blog hop and am linky following! 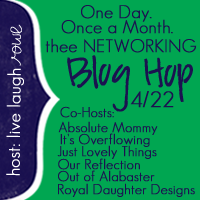 Thanks for linking up with the Networking Blog Hop. And for stopping by my blog Royal Daughter Designs. I hope the hop was a success for you! lucky you!! what a fabulous find!! I am your newest follower from the hop, pls follow back if you can. These are stunning love them. So happy to be here visiting you again, I have enjoyed catching up on all your wonderful posts, Hope you have a great day my friend. What a treasure! No wonder you fell so in love with them. I'm a bit jealous!